Cornwall Ontario – It’s been a big week for Matt Coleman. Just a few years after launching his business from the basement of his home, he has opened a storefront location in Downtown Cornwall. 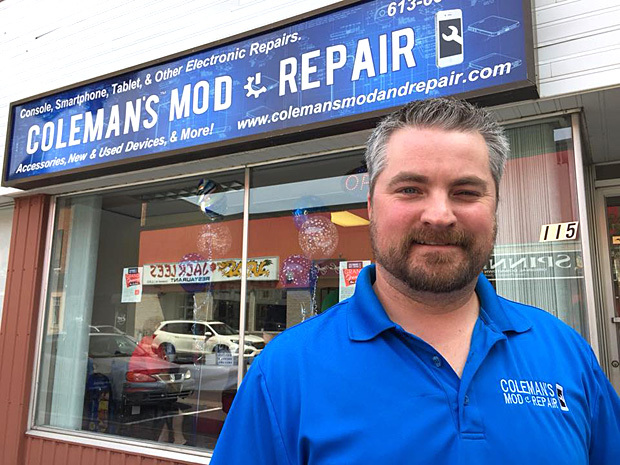 Coleman’s Mod & Repair is located at 115 Pitt Street and offers a repair service for the devices that have become so important in everyone’s life. Drop your smartphone and crack the screen? Don’t worry, Matt can help. Coleman’s Mod & Repair handles various repairs to most smartphones including Apple, Samsung, Blackberry, HTC, Nokia and more. “As long as we can get the parts, we can fix it,” says Mr. Coleman with a laugh. Mr. Coleman can also provide virus removal services, operating system upgrades and water damage repairs for MacBooks. Video Game consoles are also a specialty, including older generation consoles from Nintendo, Xbox, PlayStation and even Atari. Other services include repairs to car starters, USB cables for X-ray machines, guns for shockwave therapy and GPS units. The move to a downtown, high-profile location is a big step for the young company. As the very first Cornwall area participant in the Starter Company Program, Mr. Coleman was able to access assistance from the Cornwall Business Enterprise Centre which included training to write a business plan, organize his marketing, and create some cash flow projections. Coleman’s Mod & Repair is open Tuesday to Thursday from 9am to 6pm, Friday from 9am to 5pm 9-5 and Saturday from 9am to 1pm. The Starter Company Program has now evolved into the Starter Company PLUS program, which provides successful applicants with unparalleled assistance to start, grow or buy a small business. Assistance includes training, business skills development, mentoring from local business leaders and all-important access to capital. The program is open to residents of Cornwall, SD&G and Akwesasne who have finished school and are 18 years of age and older.